No doubt, clouds happen to be one the best creations of nature. They are formed due to the moisture present in the atmosphere reaching the dew point . This entire process takes place in the presence of a condensation nuclei. A random observer may find clouds to be of the same shape which in reality is not true. They are grouped into several categories while considering different parameters in mind. Once you start studying clouds and gather information from various resources, you will find these light weight puffy bodies more entertaining than ever. Clouds follow different patterns due to atmospheric processes and these patterns are used in the cloud classification process. What are stratocumulus radiatus clouds? 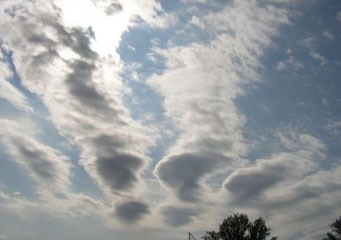 It is evident that stratocumulus radiatus clouds are one the types of stratocumulus clouds. It has almost the same features as other types of clouds that are in this group with minor differences from each other. How are stratocumulus radiatus clouds formed? Just like with all other types of clouds, stratocumulus radiatus clouds are formed because of the condensation process taking place in the air. As cold air passes over the warm air, it tends to sink. Wind plays an important in giving them their unique look. These clouds are quite common in winter season near water bodies. These clouds are believed to accompany cold fronts as well. What height are stratocumulus radiatus clouds found? Since it is a low level cloud, stratocumulus radiatus clouds do not attain sufficient height and you will see them travelling over the hills and the water bodies. The maximum altitude stratocumulus radiates clouds can attain is six thousand feet which is quite rare. They look quite threatening at times but till the time they get thick, there is nothing to worry about. Only thick stratocumulus clouds bring a message of rainfall or precipitation. What do stratocumulus radiatus clouds look like? The appearance of stratocumulus radiatus clouds is different from other types of clouds. They are the ones that are broad and run in parallel strips across the sky. As you see them closely, you will see that they look like as if they are converging on the horizon. They are usually white or grey in color. Although they are developed from stratus clouds, they are different from them as they show variations in their appearance. The major difference between stratus clouds and stratocumulus radiates clouds is that the former does not have any layers. How common are stratocumulus radiatus clouds?